Kathy Jarvis has just returned from Northern Patagonia and here are her thoughts on why you should go to that part of Patagonia. 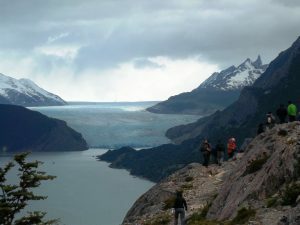 Torres del Paine and the Fitzroy mountains in southern Patagonia have long been the main attraction for visitors to Patagonia. The allure of those mountain areas is strong and the sheer drama and iconic nature of the peaks undeniable. However, tourist numbers and the accompanying infrastructure have grown at a rapid rate over the past 15 years. This year Torres del Paine National Park reached capacity. From now on there will be restrictions on access as a consequence of the sheer volume of people wanting to visit. In the high season months of December to February it can be impossible to find a place to stay, and prices are on the rise too. After my recent exploratory visit to northern Patagonia, in March and April, I would say that whilst those southern mountain areas of Paine and Fitzroy retain a strong pull on me I would highly recommend a visit to northern Patagonia as well or instead. I only had a couple of weeks to explore but am already planning a return visit next season to see some of the areas I missed, and some of the wildlife – whales and penguins, I didn’t get to see this time round. What really struck me about northern Patagonia is how it is such an immense wilderness area, of massive mountains, vast glaciers, lakes, forest and rivers. For the 2 weeks we travelled we were in amongst mountains. Whichever way I turned there was ice and snow. The lower mountain slopes, between icy summits and the shorelines of deep glacial lakes, are thickly covered in ancient lichen draped Lenga forests. Any trekking inevitably takes you through these beautiful untouched forests, which have a wonderful mystical feel about them. As well as the wilderness what is really remarkable is just how very few people there are. There are some tourists passing though, some on self-drive trips, some on bikes pedalling the 2, 450 km of the Carretera Austral. Towns are few and far between. Every couple of hours driving along the Carretera Austral there is a village or small town, little more than a cluster of wooden shingle-roofed houses, often flaking apart, and with small untended gardens, testament to long cold snowy winters and a very short growing season. I found anyone we did meet to be warm and friendly, loving to sit and have a good old blether over a mate or cup of tea. Our host, Eliana, at our bed and breakfast in Villa Cerro Castillo, served up homemade rhubarb jam. As she made us tea and we petted her numerous dogs she explained that her husband was working in the “puesto” – an outlying small cabin where he looked after their 400 sheep, and 100 horses. They can lose 15 sheep a night to pumas – females teaching their cubs how to hunt. She told us about long harsh winters and having to send the kids off to boarding school a 5 hour drive away, the depopulation, how the old log burner at the heart of the house serves as heating, oven and hot water heater, and all the best sorts of firewood. Villa Cerro Castillo, seems to be a typical north Patagonia town, with a few shops and bars – though it was hard to tell what was open as high winds and the cold mean all doors are kept firmly closed. Behind those closed doors the people congregated to chat and watch football. We ate giant burgers with chips, typical rural Chilean food, there was very little fresh fruit or vegetables to be seen, and dreadful coffee. But every one we met was welcoming and more than happy to stop for a chat. Later we trekked into the mountains, and spent 5 days there without seeing a soul. Away from the small towns there is just no one. Amazingly the impact of man here is seemingly negligible. This is a big contrast to further south, where there are so many hotels and buses of trekkers heading to the peaks, and where you may never even spot a local, just other tourists. Visiting Aysen in Chile was like stepping back in time 15 or 20 years, to what Patagonia is so good at, the wilderness, stunning scenery, the isolation, and above all the warm and friendly people. If you would like to explore this region your could consider Andean Trails’ North Patagonia Adventure Aysen Chile , or contact us for a tailor-made itinerary.